Film Star Vincent Price as Dr Phibes, Joseph Cotten, Hugh Griffith, Terry Thomas. 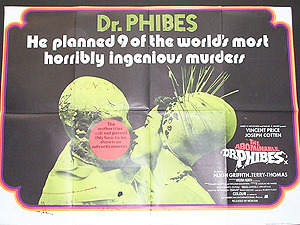 Details Phibes holds fellow surgeons responsible for the death of his wife and uses ancient plagues to exact revenge. Phibes is horribly deformed and the censor has spared the detail on the poster which is for general release.